Cashews have a delicate nutty taste that works well in a variety of dishes including stir-fries, curries, granolas, etc. They also make a healthy and delicious snack on there own. Native to Brazil, cashew trees can grow in any tropical climate, so have been exported to Africa & India which are now the major producing areas. Cashews contain less fat than most nuts, and nearly 75% of it is healthy monounsaturated fat. Cashews are also rich in oleic acid, the ‘’good’’ fat found in olive oil. Cashews are a great source of minerals especially copper, which helps our bodies utilize iron, phosphorus, zinc, magnesium, all of which are important for maintaining good bodily function. 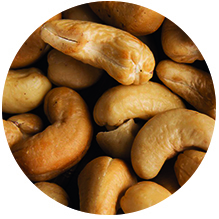 The biggest use of cashews is as a snack often roasted & flavoured with a variety of spice mixes. Cashew butter is a popular & nutritious alternative to peanut butter. Cashews pieces & flour are used in pastry and many oriental sweets.